NEW YORK - With the rain pouring down and putting the night's firsts in jeopardy, the Red Sox took note of the plush contents of the new Yankee Stadium. They were wowed by the amenities, confused about finding their way around, and interested to see whether it might hold up to the previous version. As David Ortiz said, "I liked the old place. But they did a nice building. And everything is about the memories, you know? It's our first game here. After the years, you will say, 'Forget about the old place. Let's stick with the new place.' That's how it goes." And that's how it went, Jon Lester looking fierce early and hanging on for his second win of the season in an outstanding outing, save for two pitches in the fifth. His 10 strikeouts (in seven innings) tied the career high Lester had back on June 21, 2006, against Washington, less than two weeks after his major league debut. So after a delayed 9:22 p.m. start, causing the stands to look even emptier than they had in recent homestands, the Sox won their fourth straight game over the Yankees, 6-4, last night in front of an announced 46,426. Even with two homers on first pitches by Mark Teixeira, one from each side of the plate, and with Ramon Ramirez giving up his first run of the season, the Sox came back strongly from a disappointing series at Tropicana Field. 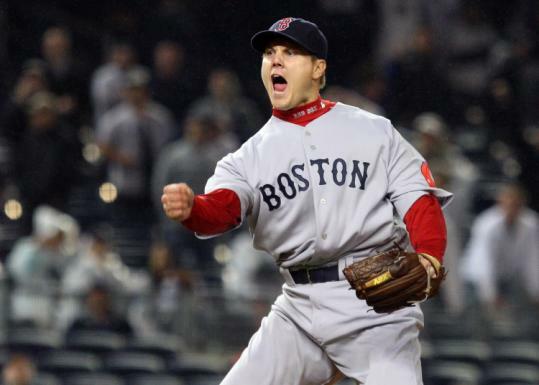 After Lester was done striking out the side in the first inning - he caught Teixeira looking for the third out - Mike Lowell took the first pitch of the second inning from Phil Hughes out to left field, the ball landing a half-dozen rows up in stands filled with frigid Yankees fans. When Lester struck out two more in the second inning, it appeared he might be breaking out of the fits-and-starts beginning to his season. "His stuff was terrific," said manager Terry Francona. "It was as good as we've seen this year. I was really happy the way he threw the ball." "I felt good, felt strong early on, got in a little bit of a rhythm," Lester said. "I think the biggest thing was not trying to do too much, and then trying to get ahead as best I could. Tek did a great job behind home plate mixing some pitches in, letting me know when we needed to really get after it." It kept coming. His first time through the order, Lester had six strikeouts, only Nick Swisher (walk), Robinson Cano (fielder's choice), and Jorge Posada (single) not falling victim. His teammates, meanwhile, were making themselves comfortable in their first trip to the new Yankee Stadium. Ortiz might have gotten lost between the kitchen and the gym before the game, figuring himself safe only in the dugout, but he looked perfectly at home at the plate. Two of his first three at-bats resulted in doubles to right field as the Sox scored one run in each of the first four innings. It was Lester's eighth strikeout, in the fifth inning, that was the most explosive. After a called strike three to Derek Jeter, a pitch that appeared slightly inside on replays, Yankees manager Joe Girardi came out to protest to plate umpire Jerry Meals. That, as usual, did not go over well, and Girardi got himself thrown out of the game. Perhaps it galvanized the Yankees. On the very next pitch, Johnny Damon hit a two-run home run to right field, scoring Angel Berroa. And on the next pitch after that, Teixeira blasted one into the bullpen in left-center to make it 4-3. "They weren't up, they were just middle," Lester said. "That was one thing that I was actually happy to see, cause most of the home runs I've given up this year have been pitches up and out over the middle of the plate. These were down, just balls that were mislocated. I can deal with that." Lester finished off the inning with another whiff, a called strikeout of Swisher, which tied his season high. It was nearly 11:30 p.m., and the game was far from wrapped up. The Sox threatened in the sixth, an error by Jeter and a single by Dustin Pedroia leading to a situation with two on and one out for Ortiz. He had reached on his first three at-bats, but this time, he grounded to Berroa at third, whose double play across the diamond retired the Sox. A tougher blow came when Kevin Youkilis came out midway through the sixth because of a tight left lower back, the same injury that kept him out of a game in Cleveland earlier on this trip. "He was having a tough time getting it loose," said Francona. "He was tight. I think we did the right thing by getting him out of there. Again, just don't want to make a mistake with something like that. It's not good." Jason Bay was not to be outdone by Lowell. The third baseman's home run had given him the team lead with six. Five innings later, Bay tied him. The left fielder doinked one off the foul pole in left field, his two-run homer scoring Drew and giving Lester a little more comfort room. "He hit that ball well," Francona said. "We're all pushing it fair, and as it turns out, we really needed it." That's because it wasn't easy in the end, with Ramirez giving up the homer to Teixeira in the eighth to narrow the score to 6-4. Jonathan Papelbon was brought on to get the last two outs of the eighth inning, and he loaded the bases in the ninth (single, hit batsman, walk) before striking out Swisher to end the 3-hour-48-minute contest. "It's a long day," said Francona. "We went out with a lot of energy. It ends up being a great night. It's late, but it was a good night."